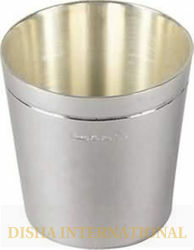 we are manufacturer and exporter of sterling silver and silver plated Barwares and all kind of bar accessories. We make these wine bottle coasters in 2 different designs and two sizes. One is 3.5 inches diameter for WINE BOTTLES and second is 5 inches for CHAMPAGNE BOTTLES. One is straight sided pattern and another is BELLY design. ALL costers are fitted with a silver or plated button for beutification or LOGO printing. The wooden base is pasted with a green color felt at the bottom to absorb any kind of liquid on the table. A nice gift for all wine lovers. We are manufacturer and exporters of wine bottle coasters with wooden base. These coasters are produced in sterling silver and silver plated both. We have different designs of coasters available in 2 sizes for wine bottles and Champagne. All coasters are finished perfectly for international quality standards and gauranteed for purity and long lasting silver plating. Coaster is fitted with a plain center button. Wooden base made of seasoned wood. All wholesalers, importers, buying agents and suppliers are requested to contact for wholesale rates. We are one of the accredited manufacturer, exporter and supplier of a premium range of Silver Wine Goblet that is used in bars, hotels, clubs etc. 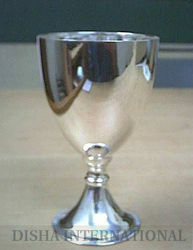 Manufactured by using quality proven silver and modern techniques this wine goblet is highly appreciated in the market for its excellent performance and other specifications. Moreover, offered wine goblet is tested under the guidance of quality experts in order to ensure its predefined qualities. We are offering customized products. Having years of experience, we are engaged in offering utmost quality of Silver Wine Pourer which is broadly used in hotels, restaurants and homes for serving wine. Manufactured by using the industry proven silver and cutting edge technology by our proficient professionals, offered wine pourer is highly appreciated for its excellent quality standards. Further, we provide this wine pourer with several specifications as per the requirement of our patrons. We are offering customized products. An exclusive range of Silver Wine Chiller is offered by us in various specifications. Made from high quality material these chillers are thickly silver coated on entire surface.To meet the varied requirements of clients, we lay out the design and manufacture winery chillers in different sizes and capacity. We are manufacturer and exporters of Wine Bottle Drip Stopper. A perfect possession or gift for win.e lovers. We make these pourers in sterling silver and silver plated as per buyer's requirement. We do 3 microns of silver plating on the product which last for many years of use. We are manufacturer and exporters of drip stoppers or wine pourers. A perfect possession or gift for wine lovers. We make these pourers in sterling silver and silver plated as per buyer's requirement. We do 3 microns of silver plating on the product which last for many years of use. 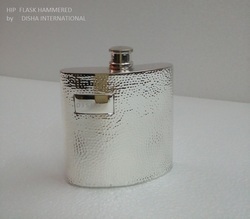 We manufacture hip flasks in sterling silver and silver plated also. They are made in plain and hammered pattern. Made with perfection by our expert artisans this flasks are an excellent gift for people who love drinking. it is an excellent gift for all occassions. Being a client centric organization we are engaged in manufacturing, exporting and supplying premium quality Silver Wine Cork Opener. Provided cork opener is made up of high grade raw material and the latest technology in adherence to industry set standards. Offered cork opener is highly accomplished by our customers for its attractive design and superb finish. This cork opener is availed by our clients in numerous customized options at the most nominal rates. We are offering customized products. 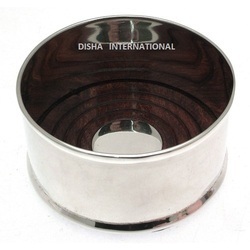 Owing to the immense experience in this domain, we are providing an excellent range of Silver Wine Collar. 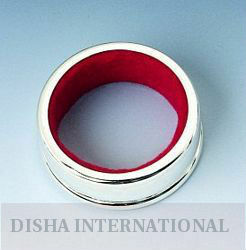 Offered wine collar is manufactured by using high grade silver and progressive technology and also tested by our experts. In addition to this, the offered wine collar is praised by our clients for its attractive look and stylish patterns. In addition to this, provided wine collar is available in varied sizes and customized solutions as per the demands of our prestigious customers. We are offering customized products. 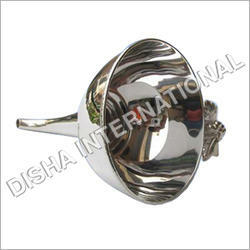 We are offering wide range of Silver Wine Funnel. 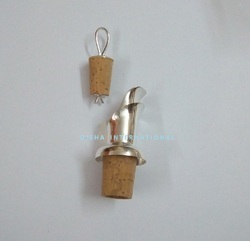 These silver wine funnel are fabricated with latest technology, advanced machinery and diligent workforce. We are offering customized products. The wine funnel became common towards the end of the 18th century; a few rare earlier examples exist. With the modern wine making methods wine funnels are generally used just for decanting wine however in olden times the wine needed to be filtered before drinking it. The pierced platform is not normally sufficient to strain the wine properly and needs a piece of muslin fitted between the pierced section and the spout. There are two main varieties: the first has a spout which detaches just below the bowl of the funnel, the other has a detachable inner bowl with a pierced centre inside the main bowl. Occasionally there is a further detachable ring which held the muslin firmly. Funnels exist without a pierced strainer and were probably used to decant liquor or possibly perfume; these are normally smaller in size. 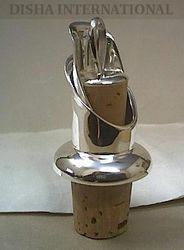 We are manufacturer and exporters of silver plated drip stoppers or wine pourers. A perfect possession or gift for wine lovers. We make these pourers in sterling silver and silver plated as per buyer's requirement. We do 3 microns of silver plating on the product which last for many years of use.